It is hard for me to believe that another year of ministry has passed – and a fruitful one at that. In 2018 IAMercy turned four years old. We are now beyond toddling and are starting to walk with more confidence. God blessed us numerically. In 2018 we had 19 people in one or the other of our holistic care programs. Moreover, for the first time we saw 100 and more people coming to some of the feedings. He also blessed us spiritually. We baptized 13 people last year and we have more who want to be baptized in the near future. Thank you to all who gave to and prayed for the ministry of IAMercy in 2018. In 2018 IAMercy reached a number of milestones. The IAMercy tree can now be broken down into three major branches: The Saint Boys Project, The IAMercy Village, and The Daily Bread Project. I am happy to share with you the fruit that God has given us on each of these branches. The last of the original Saint Boys (Julius) moved out of my home to start his adult life. He is now 21-years-old. He is no longer dependent on me or the ministry. He has taken a number of part-time jobs to make ends meet and is seeking stable employment. The current Saint Boys (a.k.a. the “Johnson family”) completed another year of instruction. Branton finished grade 3, John finished grade 4, Moses finished grade 5, and Dishon began training as a carpenter. We continue to eat at the same table and sleep under the same roof – as a family. Shiloh’s Cradle: IAMercy began caring for the holistic needs of three mamas and their children. All three of these women were abandoned by their husbands and left to care for their children alone. Janet and her five children were facing eviction when we took them into the Village. Her children had been out of school for some time due to having to beg/work in order to help their family secure basic provisions. 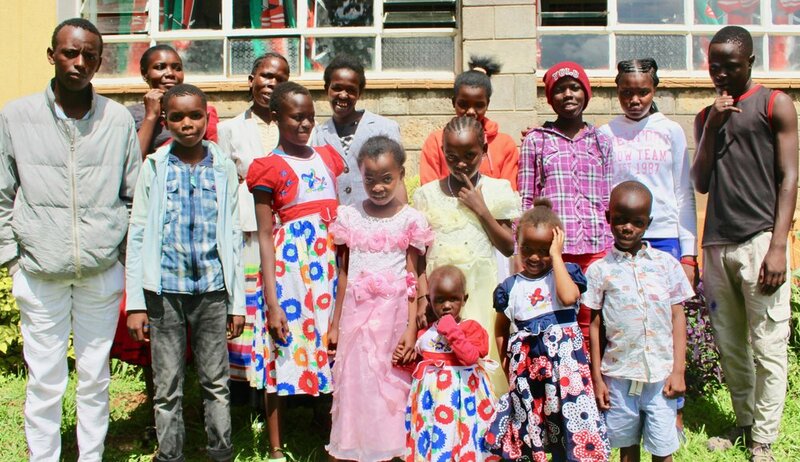 Mwajuma and her three children had already been ousted from their home and were sleeping in a storage unit for vegetables. Fidelis was still at home with her two small daughters, but she was forced into begging to try to survive. Now IAMercy is providing shelter, food, and clothing for these families. There are 3 mamas and 10 children/youth in the IAMercy Village and all of the children are currently enrolled in formal education. Saint Boys 2.0: IAMercy also started a home in the Village for mature boys/young men who used to be on the street. Boniface and Bravine began living in that home in 2018. These two boys brought the total number of people in the Village to 15 in 2018. IAMercy started seeing 100 people and more at some of its feedings toward the end of the year. We are now going through the Gospel of Mark as a group. In 2018 we baptized 13 of the people who come to the feedings upon the profession of their faith in Christ. Thank you again to all who made IAMercy’s ministry possible in 2018. For those of you who have heard of IAMercy but have not yet become involved financially, please consider giving even now to help IAMercy care for others in 2019. Please join me in praying that this year will be even more fruitful than the last.